This whole month, most of my purchases (aside from Christmas presents) are looking for holiday outfits. Every week/weekend, Tre and I have been attending holiday parties. So finding the perfect holiday outfit is a must! Whenever I find an outfit I like, there’s always something I wish I can change. I would love the style, print, and pattern, but I would wish I can change how it fits me. For instance, I love the pattern and style but wish I can change the length or the length is perfect but wish I can change the waist size. LOVE this fun, full skirt with a little sparkle. Perfect for this time of year. 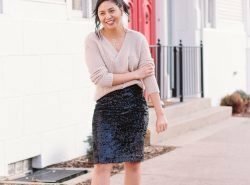 This skirt is so perfect for the holidays! Love! This skirt is GORGEOUS! You look so fabulous darling! You look so pretty, Rach! Love, love, love this look! And that skirt really is the perfect length. Oh my goodness, that skirt is gorgeous! Such a perfect holiday outfit. You look beautiful, Rach! This skirt is the most darling thing I've ever seen! You are adorable! Love this outfit on you! Thanks Kiki! It is a great company! I highly recommend them! 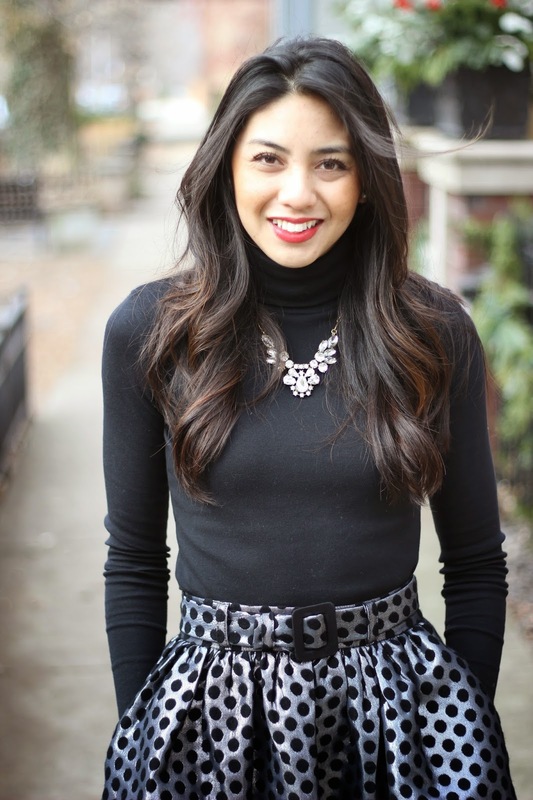 This skirt is so pretty and perfect for the holiday season! You look beautiful!! I love that skirt I have it in purple!!!! Its so darling in the polka dots! Thanks KP 🙂 We're twinsies! Love the outfit, the skirt is amazing and you look gorgeous! Oh my goodness. You look amazing. I love how you kept the top simple in order to really showcase this skirt. Job well done! This skirt is so pretty, feminine & retro all at the same time. The onset waistline is perfect for your frame. Great styling. You look great! The skirt looks amazing on you! Girl, I'm sure you can! Thanks so much for stopping by! You look great! 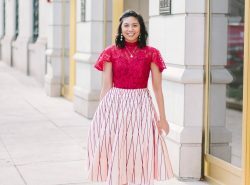 I love this midi skirt a lot! I want that skirt! It looks so cute on you, and is perfect for the Holidays! That skirt is perfect!!! You look fab! That skirt is so pretty. Great styled outfit!! Thanks Marielle 🙂 Thanks for stopping by! I am so in love with that dot skirt,i want to include one in my wardbore. You definitely should! It's on sale for less than $40!